Going up that mountainside was scary! It was like a roller coaster climbing the big hill before the drop, and every few minutes, it had a catch on it to keep you moving. I couldn’t wait to get off! Our train ride from Paris to Interlaken was smooth. The seats were extremely comfortable and fit for napping. If only they made airplane seats like that! The French countryside was lovely, with little towns dotting the landscape. My husband, Ricky, realized later that the “yellow grass” wasn’t actually grass, but dandelions and daisies! I wrote out 10 postcards on the train, only to discover that stamps overseas are outrageous! Maybe we’ll just hand deliver them when we get home. When we switched trains for Interlaken, I was starved. I got a piece of pizza with goat cheese! I couldn’t decide if it was delicious or nauseating. I think both. Then I had Ricky buy a tasty looking breadstick, only to discover meat inside. Yuck! We stepped off the train at Interlaken OST (which I learned stands for East somehow) and our wildest dream came true! Our hotel was directly across the street from the station. For once I got it right. The hotel was the nicest we stayed at in Europe (next to Tuscany), with a fluffy white comforter and two balconies overlooking Jungfrau. Ricky and I couldn’t wait to get out and explore. We paid 5 francs for 15 frantic minutes to check email with yet another dysfunctional keyboard. Need a backslash? Forget it! That made for some unneeded stress as our 15 minutes ticked away. Then we walked downtown and gawked at paragliders as they drifted down to a park of long grass filled with yellow flowers. We ate at, of all places, Hooters, because it really did have the best views — of the paragliders, not the waitresses! It was decided immediately: We have definitely NOT seen the last of Switzerland. The following morning we woke early after a rough night of sleep. The breakfast buffet was a joy — croissants and cheese was the choice of the day for us. The weather was cold and cloudy, looking once again like rain. 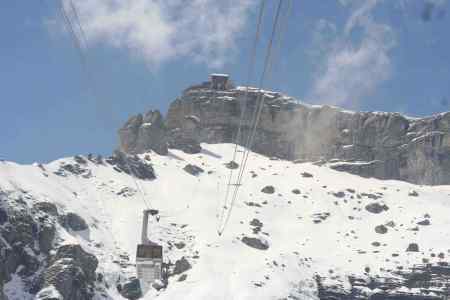 Our TV had a twenty-four hour web cam of 360-degree views from the top of Schilthorn and Jungfrau, the two popular mountain-top excursions we could take. But, it was really cloudy at the top of both, making the view a bummer. They said typically the early morning was the best time to go, since it was the clearest, so things weren’t looking too promising for us. Our hotel receptionist suggested buying tickets for our excursion only part way up to Murren. Then he said, if the weather cleared, we could buy another ticket to the top of Schilthorn. So, that’s what we decided to do. We discovered a grocery store near the train station (which we later used to get dinner and snacks). Wow — water that only cost 1-franc. The first train took us into Lauterbrunnen, the valley leading to all the fun excursions. We took a picture by the waterfall and then took the funicular train straight up the mountainside — cling, clanging the whole way up. The train was built on its side, if that makes sense, and we sat upright (fortunately). We had to climb stairs to each level of the funicular, kind of like a ride at Six Flags. Going up that mountainside was scary! It was like a roller coaster climbing the big hill before the drop, and every few minutes, it had a catch on it to keep you moving. I couldn’t wait to get off! Then we switched to a regular two-car train with breathtaking views. We were able to open the windows all the way. The train sped around the cliff sides, and snow was now in sight! 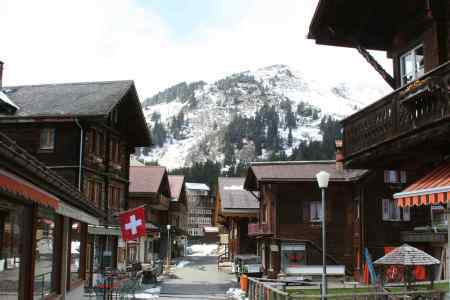 It took us to the quaint town of Murren, which has no cars at all. It was desolate being low season, and all the hotels and shops were closed. We meandered through and laughed at the foreigners who were not used to snow. Their kids had a blast throwing snowballs. We exited the cable car but, to my surprise (or perhaps dismay), we weren’t finished yet. We were led to another cable car for the remaining ride to Schilthorn. It was pretty cloudy at that altitude, and we could barely see the station through the haze. The cable car was much slower this time, obviously climbing to greater heights. As we pulled into the station, the car lightly hit the thick bumper padded sides, before allowing us to exit. It was snowing as we stepped out onto the round patio, encircling the revolving restaurant. It was probably around 20 degrees. The terrace was covered with snow and ice, making it slippery to walk. You wouldn’t want to slip and fall up there! There were only about 75-100 people visiting, probably because of the cloudy skies. We took a few pictures, and then I was freezing, so we went to the slowly revolving restaurant to eat lunch. It was expensive (like every tourist spot), so we settled for soup and bread. I tried the coffee, or café, from a tiny cup. It felt like the cups that little girls use in their tea sets. It was quite good. I couldn’t imagine the crowds in high season. We went downstairs and watched a movie with 10 screens showing scenes from Switzerland of landscape and winter sports. This was also the sight of a 007 movie, but we didn’t stick around for that show. Next Ricky and I took the cable car down and met a couple from Schaumburg, IL, where we live. Go figure! We changed cars once again at Brig and this time took a different route back to Lauterbrunnen. 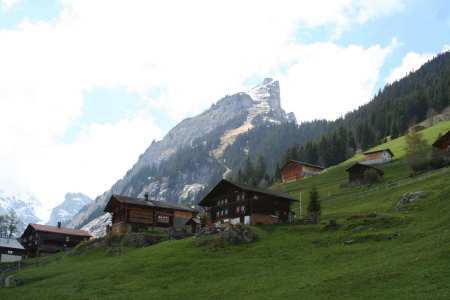 Rick Steves talked highly of a town called Gimmelwald, so we took the cable car there. Thank you, R.S.! It was well worth it. We were the only tourists in sight in this tiny farming town, and we wandered up the main, winding road past beautiful old chalets. A few residents were out working in their small gardens or in their little barns with cows and chickens. It was silent, except for the sound of trickling water from fountains along the roadside (we weren’t sure who drank from them, but we guessed animals). The town cascaded down the mountainside. We wondered how these people made a living and if their houses were insulated enough to survive what we imagined to be dreadfully cold and snowy winters. Rick Steve’s book described a husband and wife, who were the town’s teachers, in a one-room schoolhouse. Did you know those still existed? 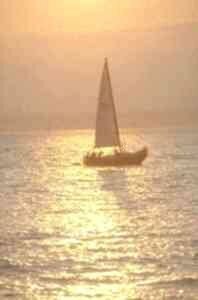 When Ricky sat down to enjoy the view, a little cat wandered up to him, rubbing against his leg. Within minutes, it had hopped onto the bench and was cuddled up next to him. Ricky got really sick of me saying, “Rick, Steve says this, Rick, Steve says that,” so beginning in Switzerland, Ricky kept teasing me. “Isn’t that Rick Steve’s?” he’d say, or “Look, there goes Rick Steves!” Funny guy, isn’t he? Yeah, I fell for it, oh, just about every time. I just had to look — it really might have been him! About a half hour later, the cable car arrived to take us almost straight down. This time it went surprisingly fast. I wonder if those cables have ever snapped… Anyway, then it was another half hour wait for the bus to bring us to Lauterbrunnen. While we waited we marveled at our sunburns. Of all places to get burned, on the snowy mountains of the Alps! Finally, around 6, we arrived back at Hotel Du Lac, desperate to find a Laundromat. By the way, if you say the word 'Laundromat' anywhere in Europe, they look at you like you have 3 heads. It is called the “Wash and Dry”. Anyway, we had a 15 minute hike to the only “wash and dry” in town. (Side note: Any time a European tells you the length of time it will take to walk somewhere, double it.) It was a pretty walk, right along the river. We crossed the bridge and hiked along, admiring the gorgeous trees and flowers. For once, we didn’t have our cameras, and wished we had! Inside the Laundromat, oh, excuse me, “Wash and dry,” we met only one group of people, Chicagoans. They helped us figure out the machines, which had (badly) translated instructions. There was a strange contraption that we were supposed to put our clothes in to spin the water out before using the dryer. It sat on the floor, about 2 feet high with a canister like lid. Of course, I couldn’t get it to work. Ricky and I took turns shopping while we waited for our clothes. We were so happy to have clean clothes! If you enjoyed reading the above article then you will probably also enjoy Paris and The Louvre by Jennifer Vargas, and Florence, also in Europe, and our latest articles covering the Orinoco Delta, La Mata, Marbella and Beijing.